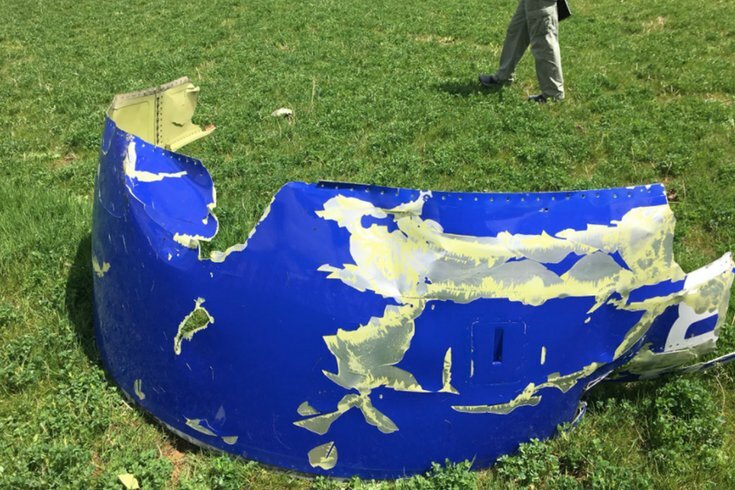 Authorities are asking residents of northern Berks County to be on the lookout for pieces of the plane that made an emergency landing in Philadelphia on Tuesday morning. Two pieces from the Boeing 737-700 twin-engine aircraft that experienced catastrophic engine failure have been found on the ground so far. A part of the No. 1 engine, the cowling, or engine covering, was found in a field in Penn Township, near Bernville, Berks County, about 60 miles northwest of Philadelphia, according to the National Transportation Safety Board, which is conducting an investigation. Investigators collected that piece on Wednesday. A second piece, thought to be debris from the plane, was found Wednesday morning on state game land near the city of Reading, according to media reports. The Pennsylvania State Police asked residents of northern Berks County to keep an eye out for debris from the plane. Southwest Airlines Flight 1380 was headed from Laguardia Airport in New York City to Love Field in Dallas on Tuesday morning when the engine failed at 30,000 feet over northern Berks County. Shrapnel struck the plane and smashed a window. The aircraft had 144 passengers and five crew members on board. A woman from New Mexico died in the incident and seven other passengers were injured, officials said. According to Robert Sumwalt, NTSB chairman, a preliminary inspection of the engine on the ground at Philadelphia International Airport late Tuesday afternoon indicated one of the 24 fan blades on the engine – the No. 13 blade – was broken off at the hub and missing.